This is Rana, and I am sharing with you my finish for March. It is the green round-about string quilt I had started in celebration of St Patrick's Day. The blocks are 12" each so it is a nice size, a quilt for a child rather than a baby. The blocks were made with the connecting square technique, so each produced 4 half square triangles. These were pressed into service as a border. And, I am happy to say, that this pretty much depleted my green scraps! Now, I am off to use up all of the blacks, and some reds and tans too! And, I am looking forward to seeing what you all have coming along as well! TTFN. Beautiful! I want to make one of those! I want it!!!! It's lovely. 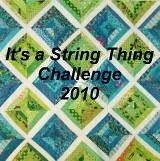 Your string quilts are great! I too love pink though I quilt with every color under the rainbow! What is the "connecting square technique"?